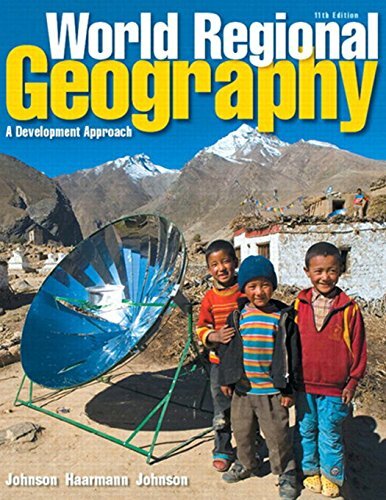 Praised for its scholarship and authoritative, comprehensive coverage of world regions, Johnson, Haarmann, and Johnson’s World Regional Geography takes you on a unique, in-depth exploration of the world’s regions. The new Eleventh Edition presents a leaner student-friendly modernized look at geography that engages you in the course and challenges you to see the relevance of geography in your everyday life. Now available with MasteringGeography™, the leading online homework, tutorial, and assessment platform, this learning solution results in an unparalleled teaching and learning package that personalizes learning and coaches you towards understanding and mastery of geography topics. Personalized learning with MasteringGeography: This leading online homework, tutorial, and assessment program is designed to improve results by helping you quickly master concepts. Students benefit from self-paced tutorials, featuring specific wrong-answer feedback and hints that emulate the office-hour experience. Content that makes geography interesting and relevant to students’ lives: The Eleventh Edition provides a wealth of engaging and current new content focusing on sustainability, energy and development issues. A structured learning path has been created to provide a framework for student engagement. Outstanding pedagogical tools makes teaching and learning easier and more effective: The material refocuses on geography fundamentals and includes a sound thematic structure, chapter-opening vignettes, and concise, useful end-of-chapter review material. Dramatic updates to the already strong visual program and language: Updates to the visual program and language provide coverage of development issues of each world region, updated and new cartography, and new and re-sized photos. Note: You are purchasing a standalone product; MasteringGeography does not come packaged with this content. If you would like to purchase both the physical text and MasteringGeography search for ISBN-10: 0321939646/ISBN-13: 9780321939647. That package includes ISBN-10: 0321939654 /ISBN-13: 9780321939654 and ISBN-10: 0321948459/ISBN-13: 9780321948458. MasteringGeography is not a self-paced technology and should only be purchased when required by an instructor.